When it comes to Delta Air Lines, Inc. (NYSE:DAL), there are two key questions. The first is whether any airline stock, not just DAL stock, is worth investing in. This is an industry, after all, that’s struggled with fare wars and bankruptcies — including Delta’s own Chapter 11 filing in 2005. The second is whether Delta stock is the best pick in the space, as opposed to rivals like Southwest Airlines Co (NYSE:LUV) and United Continental Holdings Inc (NYSE:UAL). At the moment, the answer to both questions appears to be “yes.” There are concerns in the airline industry, among them rising fuel prices and the risk of the broader economy being near a cyclical top. And there is a case to be made for peers, including LUV and international operators like Ryanair Holdings plc (ADR) (NASDAQ:RYAAY) and China Eastern Airlines Corp. Ltd. (ADR) (NYSE:CEA). But Delta stock looks awfully cheap — and it does look like the industry finally has got its act together. With travel demand rising steadily, and the near-term outlook strong, there’s a solid case for buying DAL stock at these levels. As the old saw goes, “focus on the downside and the upside will take care of itself.” And with DAL, as with any airline stock, it’s worth keeping in mind that the downside could be substantial. After all, this is an industry that has been a graveyard for shareholder value. Delta, United, and American Airlines Group Inc (NASDAQ:AAL) all have gone bankrupt this century. Online travel agencies like Booking Holdings Inc (NASDAQ:BKNG) and Expedia Group Inc (NASDAQ:EXPE) have led consumers to focus almost solely on price — and made that pricing public and easy to compare. Frequent-flyer programs aside, there’s little in the way of a “moat” or competitive advantage among the major airlines. No less than Warren Buffett famously said that “if a farsighted capitalist had been present at Kitty Hawk, he would have done his successors a huge favor by shooting Orville down.” Over time, airlines have tried to fight over revenue — instead of focusing on profits. And so while DAL stock has risen 531% over the past decade, and 265% over the past five years, the obvious risk is that it will all come to an end as soon as the industry loses its discipline. So far, the industry has been sensible when it comes to capacity. But the obvious question is what happens when the economy turns. 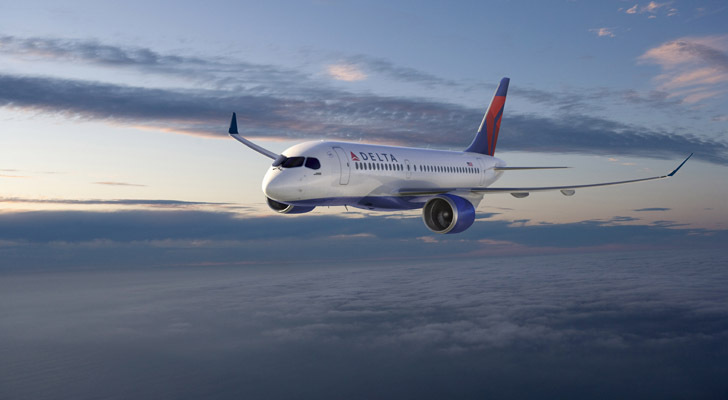 Delta itself bought 100 jets from Airbus Grp/ADR (OTCMKTS:EADSY) in December. Those jets will be delivered in 2020. But if Delta has that additional capacity, and the economy has turned south, will the company succumb to the temptation to lower prices to attract business and leisure travelers? And if competitors follow suit, will the hard lessons of the past century of commercial airline flight be once again forgotten? But after the past few years, it does seem as if the airline industry finally has learned its lesson. Capacity is rising, admittedly. Delta itself is projecting a 3-4% increase in 2018. That’s a manageable level, however. It’s enough to keep pricing discipline in place. Indeed, it’s enough to get Buffett himself to buy airline stocks — including DAL. And there are long-term tailwinds (no pun intended) for the industry. People worldwide are moving further and more often. Millennials prioritize experiences over “stuff.” Economic cyclicality aside, the long-term trend for travel demand seems to be moving in the right direction for airlines. And yet, Delta stock isn’t pricing in any growth. In fact, it’s priced as if it’s near a cyclical peak. DAL trades at 8.2x its 2018 EPS guidance. That’s a multiple that suggests profits will decline over time. In addition, it’s one of the cheapest valuations in the industry. UAL trades at about 9x 2018 consensus. LUV is at 11x. Only AAL is in the same range — and it has a much more leveraged balance sheet. It’s not hard to see DAL moving to at least a double-digit EPS multiple. Indeed, the average analyst target price suggests about an 11x multiple, to a price of $73 — some 32% upside. That’s one of the biggest gaps in the S&P 500, and an indicator of the divide between investor sentiment and the fundamental value of Delta stock. Should the gap narrow, it seems like that DAL will see solid upside. Admittedly, that requires the economy, and the industry, to cooperate. At this point, that seems a likely outcome — and so does a move higher in Delta stock. Article printed from InvestorPlace Media, https://investorplace.com/2018/04/delta-air-lines-inc-dal-stock-looks-like-compelling-buy/.